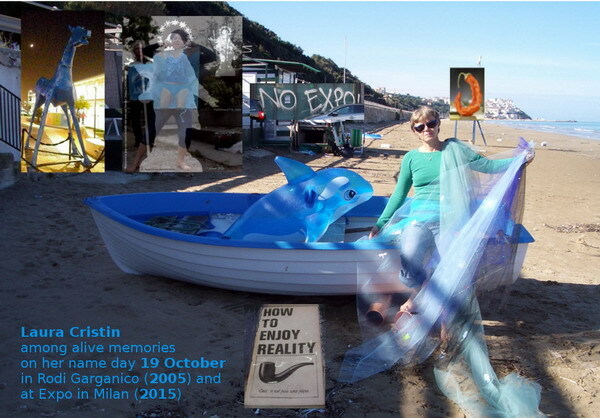 At my name-day, on October 19th, exactly 10 years after the finding of a 100 % pure plastic (inflatable) dolphin in Apulia, I visited the Expo in Milan. Entering in the site and finding a vital space in the overcrowding (the greedy profit did not resist to selling too many tickets!) was such an effort! Though, pavillions were interesting and even more the exhibition “Arts&Foods” in the city, where the (inflatable) cow “Carolina” of my childhood was displayed. Most of all I enjoyed staying with like-minded people, met again (by chance?) after Apulia and others that were/are constantly in my heART.